Seagate began operations in 1981 as a fishing company and specialty seafood processor in Baja California with a small office and a leased cold storage located in San Diego. By 1993, Seagate ventured into the health food industry by processing the shark cartilage that was a byproduct of their filleting operations, a raw material that would have been thrown away. However it was not until 1997, thanks to the encouragement of Doug Kaufmann shown in the picture below, that Seagate expanded from fishing into farming. By 1997, Doug Kaufmann had already been hosting and producing his own live Saturday morning radio talk show for several years. 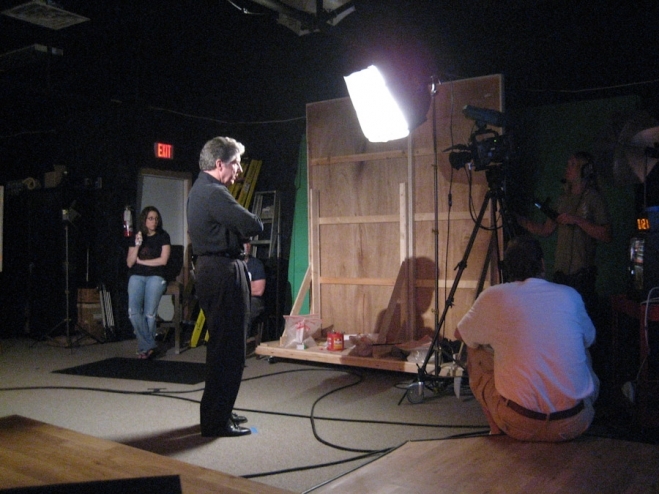 The show called “Your Health Matters”, was based in Dallas, Texas. A series of unusual events resulted in a phone call between Doug and Richard. Doug has always been very diligent to check the background of possible guests before allowing them on his show. He called to find out more information about Seagate and their fishing business. Within weeks, Richard was being regularly interviewed on Doug’s radio show and soon became his Doug’s first sponsor. The friendship and close working relationship that developed between them resulted in changes to this company and affected the lives in many people in Baja California when Seagate became a farmer. By 2001, Doug moved from radio to having his own live television talk show which eventually became known across the country as “Your Health Matters”. The idea of becoming a farmer began during one of their car rides from Love Field in Dallas. Doug would always pick up his guests from the airport and drive them to the radio station. Doug typically would have a few fresh carrots lying on the console of his car every time he gave Richard a ride from the airport. On the way to the radio station, they would be talk about the upcoming show and share the carrots. Doug of course was already recognized as a leading expert on fungal disorders and the use of the antifungal properties in fresh vegetables as a way to mitigate disorders. During one of these Saturday morning car rides, Doug suggested that Seagate set up their own farm and begin growing organic carrots. Operating a fishing company is very different from farming, especially if the only farming experience you had was taking care of a 6 ft. by 6 ft. patch of dirt growing cucumbers and tomatos in your grandfather’s backyard in New York City. However, the basic concept is the same in each situation. You need some dirt, water, seeds and a shovel … and of course a lot of sunshine. If Nature is kind to you, then a lot of things will begin to grow. 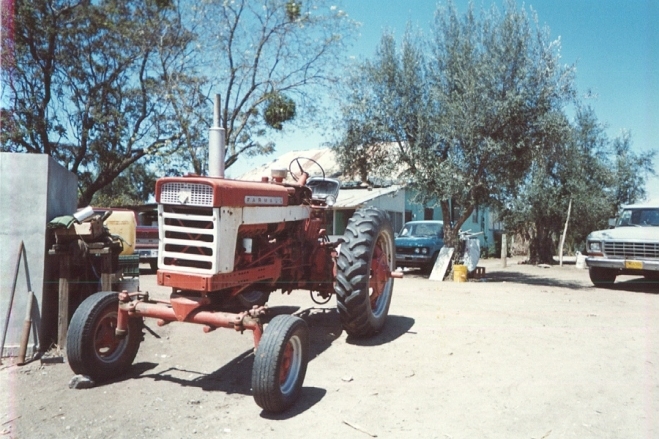 The first tractor, purchased in 1997, was a 1950’s model that is still running. Ten acres of cattle range land with its own well water were leased and an agricultural engineer hired to supervise the operation of the small farm. The first crop of course was carrots, just as Doug had requested. Carrots are a good beginner crop for teaching farming. It is a very hardy plant. There is lot of work in preparation of the land before planting. The tractor, essentially a giant mechanical shovel helps to break through the soil and till the earth. Initially the seeds were planted by hand. Drip irrigation lines were run across each row of carrots. Baja California, with its year-round sunshine, remote inland valleys and mostly warm weather is an ideal place to farm. However, it is a desert and water is very scarce. There are no running rivers unless there is a a period of very heavy rains. Therefore water much be conserved by using a drip irrigation system connected to the well. This groundwater originates from moisture collected by the western slopes of the Sierra Nevada mountain ranges that run north-south down the center of the Baja peninsula, whose highest peak Pichacho del Diablo (Devil’s Peak) reaches over 10,000 feet above sea level. It soon became apparent that leasing sections of a cattle ranch also had some problems. While the land had never been farmed before and therefore was free of pesticides and chemicals, cattle range land also has cows. Cows like to eat anything that grows out of the ground, especially sweet carrots. Barbwire fences were installed and the hungry cows were controlled. Growing vegetables without the use of chemicals, pesticides and herbicides requires a lot of hand labor. The weeds must be pulled by hand instead of being sprayed by a cousin of “agent orange”. Seagate utilizes the fish waste from their factory in Ensenada to produce the fertilizer use on their farms. In this part of the world, caring for and harvesting the carrots is done by hand. As of 2012, Seagate now has 15 years experience in farming and grows and processes a variety of fruits and vegetables including broccoli, tomatoes, garlic, lemons and pomegranates. 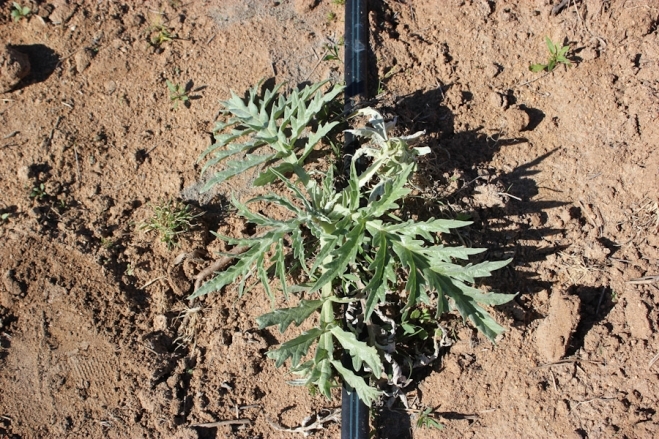 Seagate has begun to harvest their newest crop – artichokes – that were planted in the Fall 2011. All of Seagate’s crops are then delivered to their factory in the Pacific seaside town of Ensenada for freeze-drying into powders. The fish picture-of-the-week is a Queen Angelfish navigating across a shallow reef. Ada Almodovar - I enjoyed your SHOW very much keep up the GOOD work.